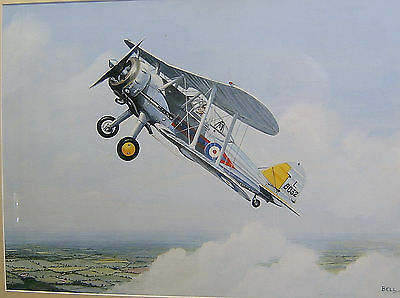 This is an original Watercolour Painting of the Gloster Gladiator II . 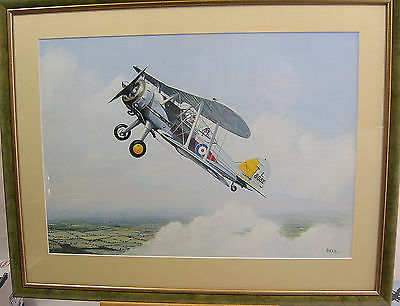 This is a genuine and unique painting (signed by the artist, Geoffrey Stewart Bell - 1930-2000, portraying aircraft L8032 which must be one of last of these aircraft to be produced - around 1935. The overall framed and glazed picture meaures 21 inches (53 cms) x 26.5 inches (67 cms) whilst the painting itself measures 14.5 inches (37 cms) x 20.5 inches (52 cms). It has been professionally framed and is in excellent condition throughout. 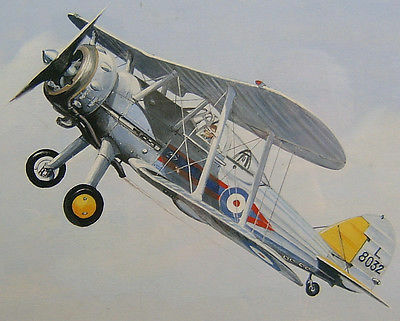 There are other and larger original aviation paintings to be found on this site so there would be a discount for multiple purchases. UK postage if FREE and trackable. I am not quoting international postage but I can provide a quote if it is to be shipped by FedEx or similar.